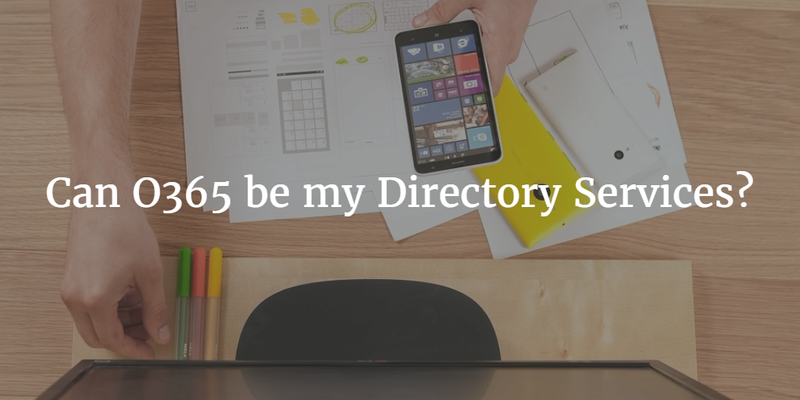 Can O365 be my Directory Services? Home » Blog » Can O365 be my Directory Services? IT admins are shifting to the cloud as quickly as they can. The cloud results in less work, better availability, and a more cost-effective model. Two of the most popular core platforms for organizations are G Suite™ for Work and Microsoft® Office 365™. While G Suite has been a participant in the cloud email hosting and productivity applications game for a long time, Microsoft only introduce O365 in 2013. Microsoft’s shift from the on-prem Exchange server and on-device Office suite to the cloud-hosted Office 365 has been a huge success. In 2015, Microsoft announced that O365 is the fastest growing product in their history. As IT organizations move to the cloud-based O365, they ask a common question: can O365 act as our directory service? In other words, does my organization still need Active Directory®? You can replace Active Directory with a cloud-based directory service. In this approach, a user will be able to leverage their O365 credentials for access to Windows®, Mac®, or Linux® systems. They can also leverage their O365 identity to access any cloud servers they may have (at AWS® or elsewhere), LDAP-based legacy applications, other SaaS apps, and even the WiFi network. In short, your organization can rally around O365 identities without the use of an on-prem directory service like AD or OpenLDAP™. The benefits of this are significant because users are able to have a single set of accounts for all their business-related IT resources. The end result is that IT admins are able to better control and secure the IT infrastructure. You may be wondering how this can work if you aren’t using Active Directory. Perhaps the answer lies within Microsoft’s relatively nascent Azure® Active Directory? Unfortunately, that’s not a realistic option. Azure AD is focused on controlling user identities with services within Azure. So it doesn’t excel when it comes to managing access to the wide variety of infrastructure and devices outside of Microsoft that are in use at the average office today. The real solution is Directory-as-a-Service®, a cloud-hosted unified directory service. 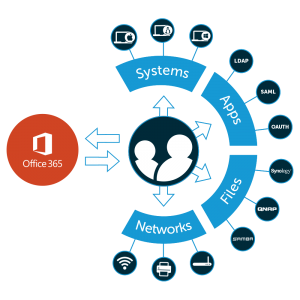 The Directory-as-a-Service platform integrates tightly with Office 365 to sync and then subsequently provision and deprovision users. The virtual identity provider becomes the authoritative source of truth for user identities. The sync process imports any O365 users into the JumpCloud® cloud directory. Those users can then be federated to whatever services that they may need, including systems, applications, or networks. IT admins can make the move to the cloud and not be held back by legacy directory services. Organizations no longer need to jump through hoops and have multiple directory services. A cloud-based directory service that tightly integrates with O365 can unify all of your identities and IT resources. If you would like to learn more about how JumpCloud Directory-as-a-Service can support your shift to the cloud, drop us a note. Our O365 provisioning and sync functionality can enable your organization to leverage One Identity To Rule Them All®.